Monitor Audio fills a Platinum gap with the PL200 | What Hi-Fi? 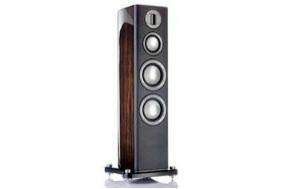 Selling for £4750 a pair, the PL200s come with a stabilising plinth, and stand just under a metre tall. The shaped, braced cabinet comes in a choice of lacquered Santos Rosewood and Ebony real wood veneers, or black piano lacquer. with the front baffles upholstered in leather.